Arthur Russell epitomised the spirit that defined downtown NYC in the 70s and 80s. Yet his inability to complete projects resulted in limited output. 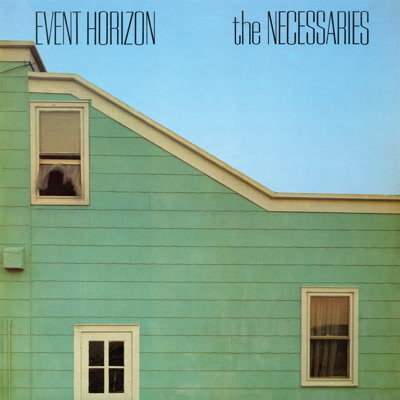 Be With now present the reissue of Event Horizon, an album Arthur did finish with his cult group The Necessaries. Criminally neglected for 35 years, its scarcity on vinyl has caused it to evade his most diehard fans and its relative obscurity has rendered it largely unknown, even amongst Arthur acolytes. Arthur played keys in the new wave/power pop quartet, as well as writing half the songs and contributing his inimitable vocals and avant-garde cello. Fronted by the muscular guitar of lead singer Ed Tomney, the band was rounded out by Ernie Brooks (The Modern Lovers) on bass and drummer Jesse Chamberlain (ex-Red Crayola). The record was produced by the legendary Bob Blank and featured the pulsing trombone of Peter Zummo. Event Horizon represents the partial overhaul given to The Necessaries' first record Big Sky (1981). Renamed and relaunched in 1982, The New York Rocker described the revised LP as benefitting from "some shuffling, some trimming of deadweight and the setting of real gems in their place. The biggest plus – "More Real" - is easily the prettiest song the Zombies never wrote". That track, as well as the towering "Driving And Talking At The Same Time" (below), "Detroit Tonight", "On The Run" and "The Finish Line", came from the pen of Arthur. They are undoubtedly the best tracks on the album, wonderfully capturing Arthur's softer, more melodic approach to pop. With an uncompromising post punk attitude, The Necessaries blended distorted guitars and loud drums with melodious, intelligent songwriting. It's weird and minimal, but it's still resolutely pop. Like much of Arthur's work, the songs are warm, shimmering and modern; catchy, hypnotic and utterly timeless. As well as handling a lot of the lead vocals, he arranged the tracks too, stripping away some of the new wave poppiness and adding his signature beautiful moodiness. It sounds like the most transcendent idea of what pop music could be. Event Horizon should've been one of the most influential records in rock music history. Like most slept-on classics, it didn't make the immediate impact it intended to, and was forgotten by Sire and, eventually, by fans. Nevertheless, Arthur forged ahead with his solo career after abruptly quitting the band by jumping out of the van at the mouth of the Holland Tunnel in New York, while on the way to an important gig. Whilst Event Horizon will appeal to all Arthur Russell completists, it demands further examination beyond his fans. It's long been an elusive missing piece to the lore of the downtown scene, but it won't be for much longer. Art Pop? Jangle Pop? Power Pop? Whatever. Far ahead of its time, this is pure pop for now people.